Check out the April Highland Woodturner! 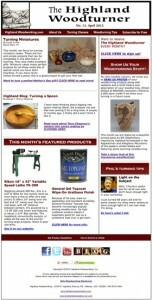 The April issue of The Highland Woodturner is now available! This month we’ve got a great column by Curtis Turner on turning miniature vases – just in time for Mother’s Day! And if turning vases isn’t your cup of tea, check out Terry Chapman’s article about his process and inspiration for turning a spoon. A new featured turning by Bill Stephenson and a great woodturning tip from Highland woodturner Phil Colson plus a couple great woodturning tool deals round out this issue. We hope you like it – go take a look! Take a look at the April Issue of The Highland Woodturner! Check out the August edition of The Highland Woodturner: Now Available!